It's the cusp of Fall and I've got a few days off - the forecast is calling for good weather for the next few days. Road Trip! 1023 KM's as it turned out. 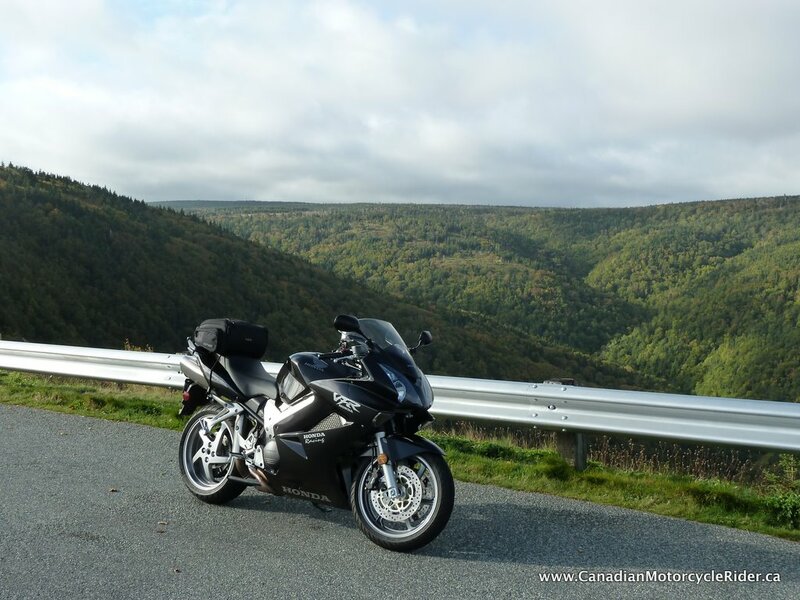 With my tail bag packed with the essentials it's time to hit the Cabot Trail. 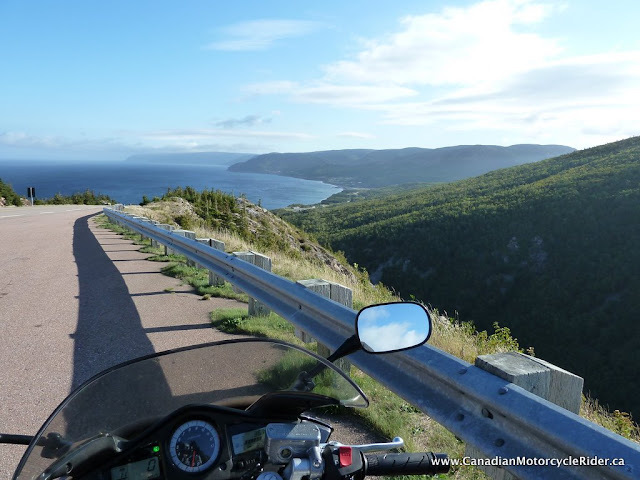 The Cabot Trail has been on my list of "must do" rides since I moved back to Halifax three years ago. With no set plan or reservations I set out early on a late September morning. The weather is beautiful if not a little cool. Time for some adventure and relaxation. The Cabot Trail is an approximately 300 KM loop that takes you along the northern tip of Cape Breton Island, passing along and through the scenic Cape Breton Highlands National Park. It has been named one of the most scenic drives in Canada the reasons for which will be clear after you've ridden it. It is spectacular. It's no wonder that Alexander Graham Bell made Cape Breton his home. If you're riding from mainland Nova Scotia - you're going to be accessing the Cabot Trail from the mainland via the Canso Causeway and heading towards Whycocomagh - a First Nations community whose name roughly translates to 'Head of the Waters' because of its placement on an arm of the impressive Bras d'Or Lake (designated a Biosphere Reserve by UNESCO in 2011). I had a vague plan to do a counter clockwise run so that I'd be in the outside lane the whole time but I thought I'd just play it by ear and see how I felt as I got really close. 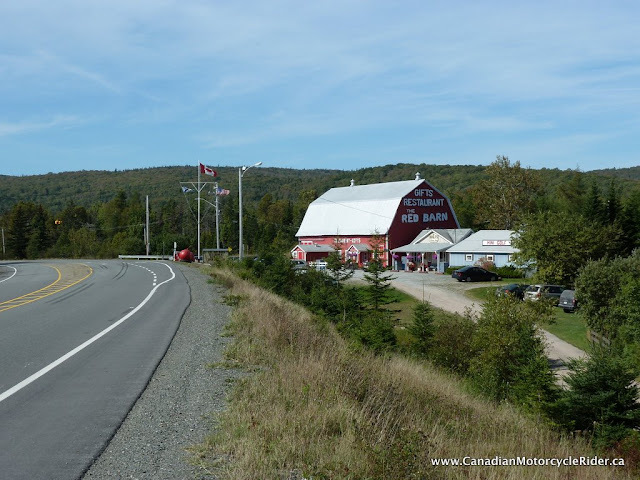 After a stop in Whycocomagh for a coffee and some lunch and a chat with some fellow bikers I ended up at the Big Red Barn (the entrance of the trail for a clock-wise run). The Big Red Barn is the landmark you're going to be looking for as the first entrance of the trail. The trail is marked very well so you can't miss it anyway. It was late afternoon and I decided to continue on because I knew there were lots of places to stay along the western coast (and wasn't sure about the eastern coast) and by starting my ride around today I would have more time to explore the next day. The views along the western shore are tough to beat. The first glimpses of the ocean are where I really started to get excited, yet relaxed at the same time. What could be better than riding in the sun, on a fantastic strip of road with the ocean by your side with the smell and sounds of the ocean permeating your senses. All these sensations together and you can't help but feel happy to be alive and in this place. Things start to get really fun when you hit Margaree Harbour. Yes, hello Ocean! It also puts you firmly in French communities that dot the coast. The beautiful Cheticamp is where I ended up staying over night. I found a little Bed and Breakfast along the road that included a breakfast. It was clean and VERY quiet and pretty economical. Around $70 + tax. I settled into my spot in the early evening and decided that I'd go get a bite to eat for supper. Some local seafood fit the bill nicely at a restaurant overlooking the Cheticamp harbour. There's also a Tim Horton's in Cheticamp which I visited that evening for a coffee. It was a busy spot - seems like everybody in town was there, chit-chatting away in French as I sipped my coffee and imagined what they were talking about. I slept good that night. Up early the next morning to get on the road and enjoy the day. One thing you really should pay attention to when riding the trail is the posted speed limits, particularly on sharp curves. Those limits aren't suggestions. They may save you from a really nasty experience. Slow down to the posted speed, even if you are an expert rider. The curves are sharp, the grades are steep, and other drivers may be distracted by the scenery or taking turns too quickly themselves. Then there is the distinct possibility that a truck or motor home may have kicked some gravel on the road. Since I'm doing my ride late in the season and during what is for most - work days; I have the roads mostly to myself except for the construction workers that is. Construction - there was LOTS of it going on. They were digging out the ditches and performing some much needed maintenance. There were long stretches of this construction going on throughout the trail and I had pretty regular stops. Some of them felt rather long too - 15-20 minutes in some cases. Luckily I wasn't in a hurry. One tip I had gotten was to make sure that I took the road to White Point at the North Eastern tip of the ride. It takes you on a more scenic route with ocean ocean views for a little stretch of the trail rather than the slightly more inland route. Definitely worth the slight diversion! 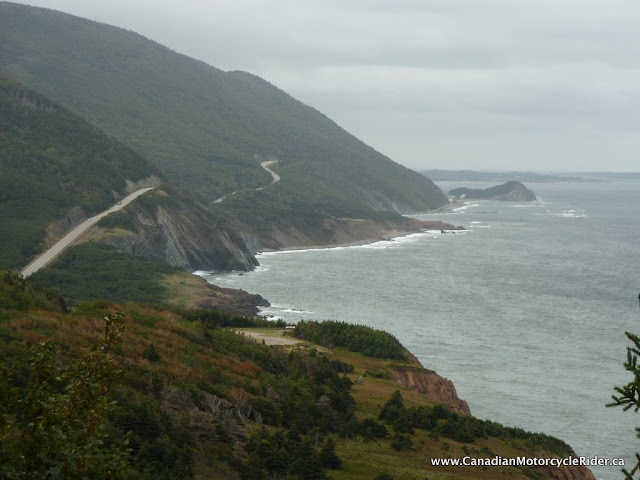 It makes a great overnight trip from the city but might be even nicer if you take another day or two and take in a few of the fantastic hiking trails that dot the Cabot Trail. Next time maybe I'll go clockwise!